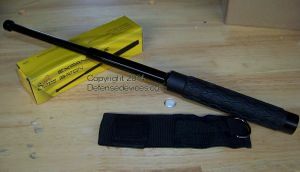 The best expandable baton for the money, for your self defense. This 3 section solid steel extendable baton opens to 16 inches and collapses to 6.5 inches when closed. Theses batons are made of heat tempered steel for extra durability yet still very affordable. Grip is firm rubber with diamond studded pattern to help retention even if hands are wet. Keep one on hand in the car, RV, or backpack for added security in case of attack. Opens with a flick of the wrist. Strong enough to use for striking and thrusting at your attacker. See our video on opening and closing the baton. All baton models come with strong nylon holster with D-ring to allow securing to leg and a belt loop. This form of impact weapon has replaced previous versions for police work and personal defense. Avoid striking the head unless deadly force is called for. Aim for limbs and body to cause pain and bruising. 16 inch weighs 14 oz and is almost 7 inches long when collapsed. 21 inch weighs 17 oz and is about 8.5 inches long when closed. 26 inch model weighs just under 20 oz and is 10 inches long when closed. By placing an order, the buyer represents that he/she is of legal age, and will use all products including telescopic batons lawfully according to applicable federal, state and local laws.